I figured since the cold weather keeps dragging on and on and on (especially for you northerners), it'd be nice to have something to cheer you up and make the chilliness a little more enjoyable. 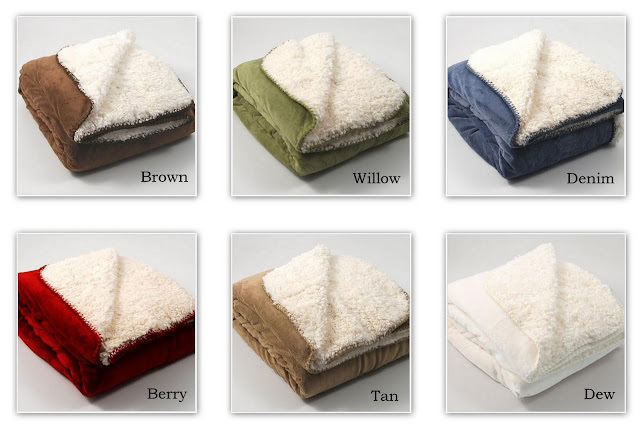 Which is how I chose my next giveaway item: The Daniadown Sherpini Throw. Doesn't it look so incredibly soft and cuddly? It totally makes me want to curl up on the couch with a cup of coffee and a good read. In fact, I have a blanket just like it in brown that I absolutely love. Thanks to CSN Stores for sponsoring this giveaway! One entry: Leave a comment on my blog (not Facebook!) telling me which color you like best. Additional entry: Post a link to this giveaway on Facebook and leave a comment telling me you did so. Additional entry: Put me on your blogroll (that list of blogs that shows up on the sidebar of your own personal blog) and leave a comment telling me you did so. Additional TWO entries: Write a post on your own blog mentioning this giveaway with a link to this post. Then comment below and provide a link to your blog post. That gives up to 5 entries per person! Please note: If you are reading this on Facebook, please leave comments in my blog. Facebook comments will not be counted. The giveaway will run now through 11:59pm this Thursday February 24th. All entries must be received before that time point.